Again this year on Sunday May 2nd the Northwest Koi and Goldfish Club had the wonderful opportunity to set up a display for the children at the Japanese Garden for Children’s Day. A tank was set up for the fish on Saturday afternoon on the deck of the pavilion and Larry, Pat, Bill and Linda had a fun time on Sunday introducing the children (and our future koi keepers) to the koi. This spring our weather was unusually warm and we had a beautiful day with lots of sun, which is certainly an exception at this time of year in Portland. The children had a great time viewing and occasionally petting the koi. We were all kept very busy answering all sorts of questions about the koi and handing out lots of fish stickers to all of these very enthusiastic future koi keepers. We also printed up lots of pamphlets, which were done specifically for the children to educate them about the koi at a level that they could easily understand. 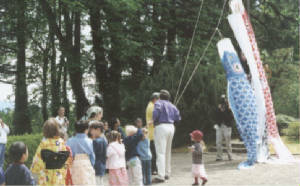 This exciting day began with the children helping to raise the koi no bori (carp kites) on the flagpole. As the day progressed the children enjoyed many demonstrations and activities at the Garden. 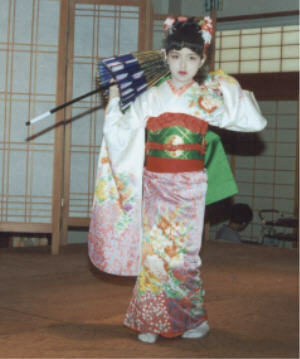 The Japanese Tea Ceremony, traditional Japanese dance, and the Taiko Drummers all performed for the children. There was also an abundance of hands-on activities for the children to participate in which included: koi drawings for the children to color, block printing, sumi brush painting, ikebana (flower arranging), and origami koi for the children to fold (provided by Northwest Koi & Goldfish Club). But the koi viewing was definitely one of the most popular of the activities at the Garden. The children came back repeatedly to pet and enjoy the koi and Traveler (a large and extremely friendly yamabuki ogon) came up to greet each one of them just as he did last year. Several children remembered Traveler from last year and came running up to the tank to see him. We were all kept quite busy answering all of the questions by these inquisitive little minds such as….”How old are they?”, “Do they bite?”, “How big do they get?”, “How long do they live?”, “Do they have names?”, “What do they eat?”, and many other fun questions. The warmth of the children and the beautiful spring day helped to make this a very memorable and enjoyable experience for the members of the Northwest Koi & Goldfish Club. We hope to continue to help with Children’s Day at the Japanese Garden for years to come!